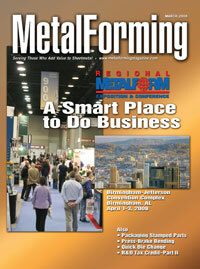 Make plans now for METALFORM, April 1-3 in Birmingham, AL. Wisco Industries saves power and time by upgrading to all-electric and electric-hydraulic equipment. Green not only as in environmental friendliness, but in the investment required by stampers and their customers to move from disposable to reusable packaging. An article explaining the R&D tax credit appeared in the January issue of MetalForming. In this follow-up article, three metal-stamping companies describe how they successfully applied the tax credit, and how they used their new-found cash. More than 40 presentations address metalforming from shop floor to top floor. The move from small single-stage dies to large 1000-lb. progressive dies easily justified the investment in a new die cart, for safety and productivity reasons. How Valuable Is One Data Point? Thinking of Making Your Kid a Stockholder? Buddy, Can Ya Spare an Engineer? Tool Steel for Advanced High-Strength-Steel Apps.